Looking to make Penang food? 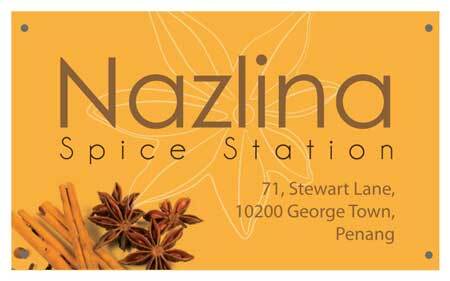 Check out Nazlina Spice Station. On September 21st, I had an opportunity to participate in the Nazlina Spice Station cooking class. This is a great class to learn how to make Penang food. As soon as I arrived, I met Nazlina and Peter. Nazlina is from Malaysia and runs the cooking section of the class and Peter is from Holland and runs the market tours. Breakfast was already ready and it was a tasty roti with egg and curry based dip along with some coffee. Peter explained that we were going to visit several markets including: a fish market, and a fruit and vegetable market. But first, Nazlina asked us if we had anything in particular we wanted to make. I told her how I liked the sauce that is called sambal and if we could incorporate it into the cooking. I would later find out that we would be making the sauce from scratch to incorporate into one of the main dishes. At the fish market, there was fresh deep-sea fish, barracuda, bean sprouts, and a vendor that carried different kinds of spices that could be delivered to local vendors for their restaurants. The trip to the fruit and vegetable market was very informative because I got to learn about the different fruits and vegetables used in Malaysian cooking like: jack fruit, winter melon and cucumber, green pandang, amra which is used for juices as well. Along the way, Peter explained the various fruits and vegetables and how they were used in the local cuisine. I also liked how he had relationships with many of the vendors in the area. 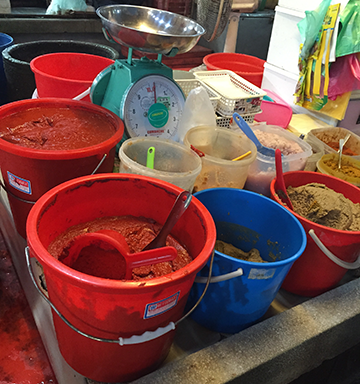 Once we finished visiting the local market, we went back to the cooking school to start preparing our dishes. That is when Nazlina had the 4 members of the cooking class prepare the main ingredients for the sambal sauce. Those ingredients would be: cayenne chili, shrimp paste, onion, ginger, garlic and lemon grass. The first task was to chop up all of the ingredients and this was done as a group with different members chopping up the various vegetables. I learned a great tip from our instructor of using a spoon to peel the ginger, which is a safer alternative than using a knife. Once we got everything chopped, the herbs were heated up on a pan and we had to grind all of the various ingredients. The grinding aspect actually took quite some time since Nazlina recommended that you should not see the onion. Once everything was grinded, the cooking began. We used different pastes for the chicken and potato curry and barramundi stuffed with sambal. Our instructor split us into two different groups (a great idea so we could work on the different pastes) and we heated the paste on the pan on medium heat. I am going to focus on the sambal since my partner and me were in charge of it. Cinnamon was also added to the paste once as it started to heat up. The goal was to heat it long enough for all of the spices to cook. The main dish would be a barramundi fish stuffed with sambal in the belly and the outer areas. This would be cooked with banana leaf in the pan. Heating up the sambal in the pan. The fish was so juicy and tender. We also prepared an appetizer dish, which incorporated rice with ginger, peanuts, cucumber, sambal and coconut milk. Our instructor even showed us how to fold it in a way it would be prepared for restaurants. Finally, after all of the hard work and preparation, the dishes were ready to be eaten. There’s nothing more satisfying than sharing a meal with others that you’ve worked hard to prepare. I really appreciated the fact that Nazlina and Peter sat down with us to enjoy the meal. You could tell that they were very knowledgeable about the different types of food in the region. After eating, all of us stayed for quite some time discussing different types of food that we’ve eaten along our travels. This is a great class to learn more about Penang food. Being able to make it, was just an added incentive! Class cost: The class costs 160RM for adults and 110 for children.